The small Ozark Mountain town of Henbane holds many secrets, and Lucy Dane is haunted by two of them. Folks still whisper about her mom, Lila’s, disappearance years ago when she was only an infant, and now her friend Cheri has been gruesomely murdered. 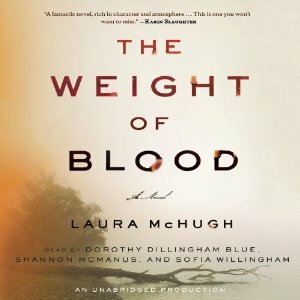 The Weight of Blood tells two stories, decades apart. The first takes place in the present and is told from Lucy’s point of view. The second, decades earlier, is Lila’s story, and the one I found most compelling. In the second half of the novel the author departs from the alternating points of view of Lucy and Lila, introducing points of view from several other characters. While making it a little more challenging to follow, this added a layer of complexity and insight into the minds of the other characters. We move between the past and the present as the two story lines are deftly woven together into a suspenseful mystery. In the present, Lucy struggles to find answers to the decades-old mystery of what happened to her mom plus her growing guilt at not having been a better friend to Cheri. In the past, Lila’s story unfolds. Young Lila’s parents were killed in an accident and when none of her relatives could provide a home for her, she was placed in foster care. Upon reaching legal age, she leaves Iowa and sets out on her own to accept a job in Henbane working for Crete Dane, Lucy’s uncle. But Lila was naive and didn’t understand the implications of the employment contract she signed. Her troubles were just beginning. The characters were well-developed and interesting, with the atmosphere of the Ozarks a character in itself. The fact that Lila was not from the area, and was darkly beautiful, almost exotic, created another layer of tension among the townspeople that lingered into the present. Some of the secrets eventually revealed were creepy but realistic of what families will do to protect each other, and how those considered to be “outsiders” are treated. I enjoyed the audio although I did have to work a little harder than usual. Even with three excellent narrators, the listener needs to pay close attention to the story for the changes in time period and the many changes in point of view. It was made even more challenging by the fact that some of the characters are present in both time lines and the narrators voices often sounded similar. This did not diminish my enjoyment of the book; however, those new to the audio genre might want to try something a little easier to follow before diving into an audio of this complexity. Excellent review as usual, Leslie. It does sound like you’d need to concentrate while listening to this this audiobook. I loved this one and mostly listened at work, but admit to being a tad confused by the timeline changes — not too bad though, still a great story. I’d read it for the suspense AND the setting!